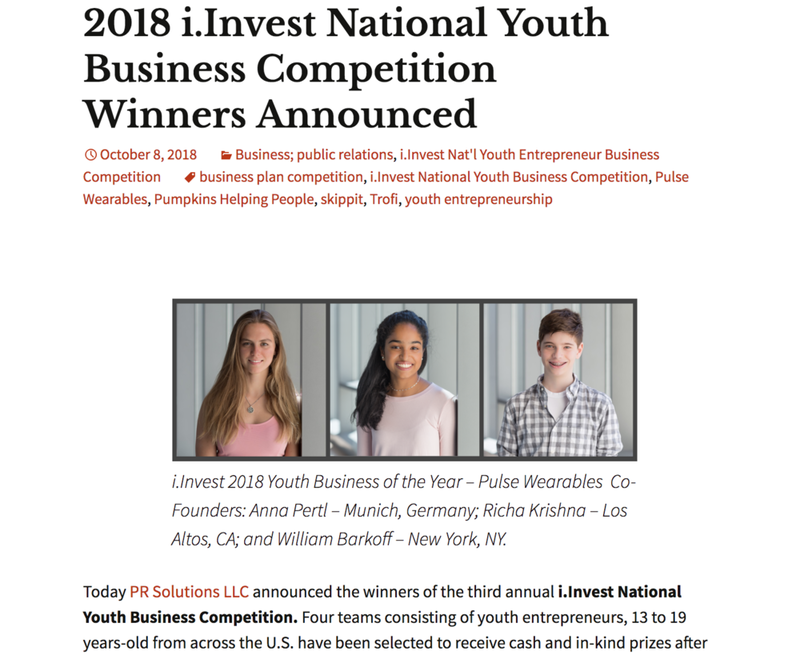 Los Altos High School newspaper featured Pulse Wearables co-founder, Richa Krishna, in the annual magazine. Received first place — i.Invest 2018 Youth Business of the Year award— earning $2,000 cash and a one-on-one consulting session with Don Morrison, serial entrepreneur and chairman of deal flow at BlueTree Allied Angels and former President and CEO of American Eagle Outfitters. Over the course of 5 months and through a number of rounds (one-on-one and group sessions) i.Invest helped us identify what is truly essential in building our business and hone in on our goals. In addition, we placed first in a social media challenge, measured by number of likes received on the i.Invest Popular Vote platform. Selected through a first round of virtual pitching from a larger international pool of 700+ teams, the Pulse team pitched at the Danville Regionals. We went through two rounds of intense pitching to place in the Top 3. We were invited to the Diamond Challenge Youth Entrepreneurship Summit held at the University of Delaware. It was fun to meet students from all over the world with a wide range of ideas to change the world. Thrilled to announce that we received our first Grant of $1000 from LaunchX. Having the money helps us take risks and experiment through prototypes. We hope to use the money to launch our website, and take our prototype build to the next stage. Pulse Wearables was featured on LaunchX Blog. 4 out of the 70 students from MIT Launch were selected to represent the program and share their businesses with the Innovation Showcase TV show in Boston. Innovation Showcase features and highlights a range of groundbreaking efforts throughout the state of Massachusetts. The main purpose of the ongoing series is to inform viewers about exciting innovations and creative individuals across the fields of business, science, technology, education, and the arts. Two of the invitees were from the Pulse Wearables team!